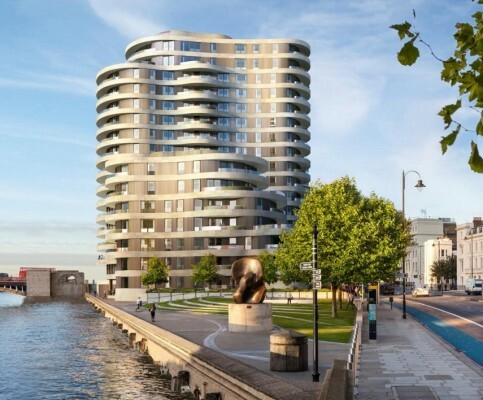 The location was used in the latest James bond film ‘Spectre’ as the site of a fictional tower opposite the decaying MI6 building on the south bank of the River Thames. Most of the shots inside the fictional tower at Riverside Walk Gardens were from the Greater London Assembly’s (GLA) City Hall building. Derwent London is the largest real estate investment trust focused on the London property market. The portfolio is spread mainly across central London and now totals 5.3m sq ft (490,000 sq m) worth £2.7 billion. 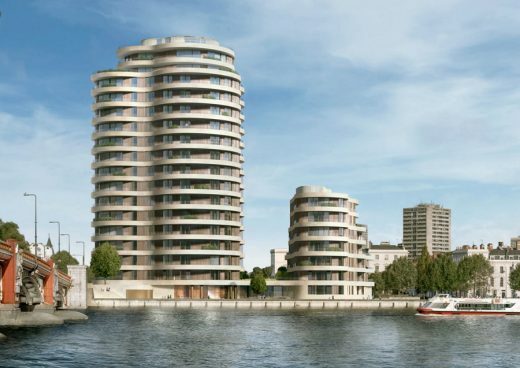 Ronson Capital Partners LLP (“RCP”), the investment firm established to invest opportunistically in real estate assets in the UK, today confirms the start of development of Riverwalk, SW1, its waterfront residential development, destined to become the premier riverside address on the north bank of the Thames in the heart of Westminster. The building is formed of ‘strata’: curved horizontal bands of limestone at each floor level that alternate with ceramic and glass bands to form windows and balconies. Set backs on the upper floors allow penthouses to enjoy larger terraces while giving architectural definition to the building roofscape. The design includes an important investment in the public realm. The walkway along the river is widened and with improved landscaping. Below ground, the incorporation of car and cycle parking, building plant and technical services in an extensive basement area allows the purity of the building’s architecture to be fully expressed.